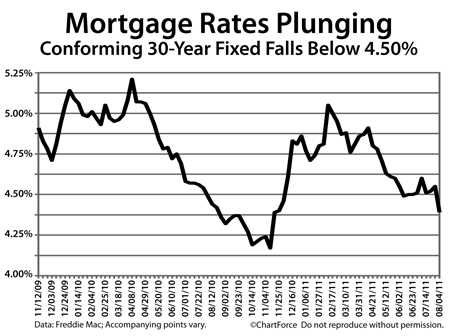 Mortgage rates in TN plunged to new 2011 lows this week. According to Freddie Mac’s weekly Primary Mortgage Market Survey, the national, average 30-year fixed rate mortgage fell to 4.39% this week — the lowest 30-year fixed reading since November 18, 2010. The 0.16 drop from last week is the largest one-week rate drop in more than 2 years, and, although the 30-year fixed remains above its all-time lows from November 2010, two other benchmark products made new records this week. Both the 15-year fixed rate mortgage and the 5-year ARM are reporting lower than at any time in recorded history. Freddie Mac puts those average rates at 3.54% and 3.18%, respectively. The first two items are unfavorable for business and, as a result, stock markets have sold off all week. The Dow Jones Industrial Average posted an 8-day losing streak and Thursday it made its biggest one-day loss since 2008. When equities lose, bonds tend to gain. This leads mortgage rates lower. Mortgage rates also fell on “safe haven” buying; bond buys made because of their relative safety to risky assets. Mortgage bonds are considered “safe” so when economies and geopolitics are uncertain, mortgage rates improve. Going forward, there are reasons for mortgage rates to fall again. The economy won’t rebound overnight and neither will investor confidence. However, markets can be fickle and rates have been known to reverse quickly. With rates as low as they’ve been history, it’s an advantageous time to refinance your home loan, or purchase a new property.